Starbucks Japan's new Classic Tiramisu Frappuccino is basically tiramisu you can drink with a straw as it features sponge cake soaked in coffee mixed into a blended custard Frappuccino base that is made with mascarpone cheese and egg. The concoction is then topped with whipped cream and dark chocolate powder. To make sure you can get all the coffee-soaked sponge cake pieces in the Frappuccino, a extra-wide straw is included. The Classic Tiramisu Frappuccino is available through April 10, 2019 with a price tag of 590 yen (~$5.29 US) for a Tall. 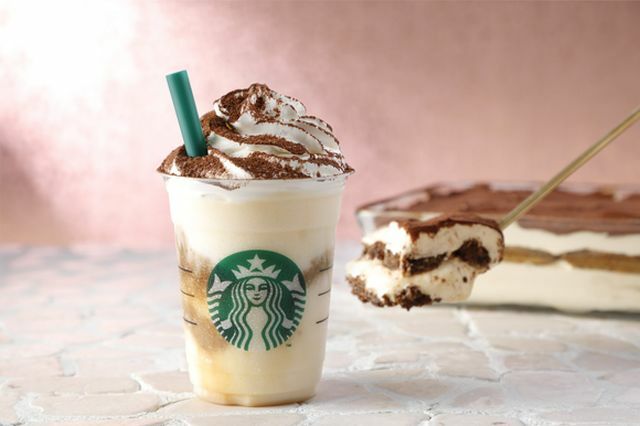 This is not the first time that Starbucks has offered a tiramisu-themed Frappuccino in Japan. Back in 2013, they offered two varieties where the tiramisu aspect was found in the topping--a cream cheese mousse.